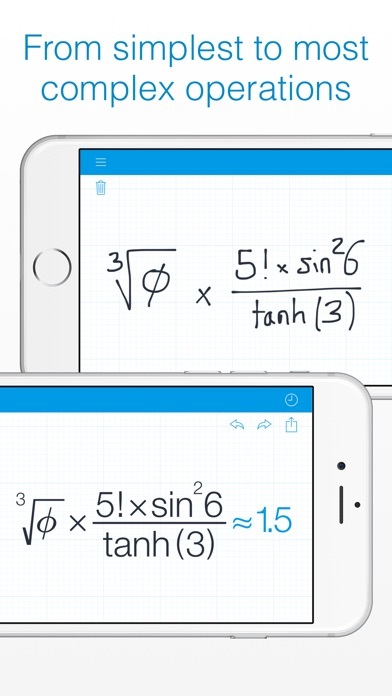 MyScript Calculator allows users to hand-draw equations on the device’s screen, converts them to text and solves them. It includes the functionality of a scientific calculator and can balance equations with a question mark serving as a variable on one side of the equals sign. 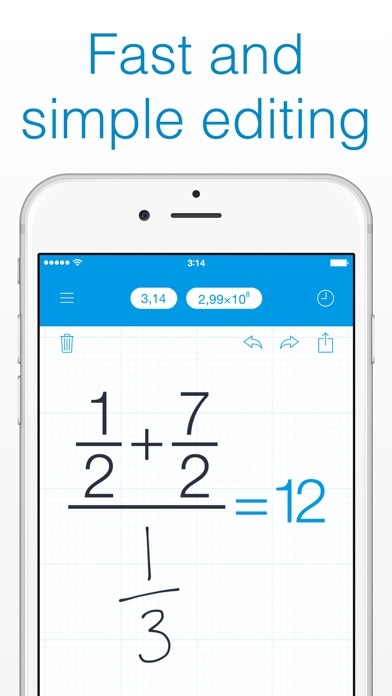 MyScript Calculator is a very useful, high-quality app that is sure to please math students everywhere as well as provide practical help for anyone needing to quickly enter calculations (even complex ones) on the run. 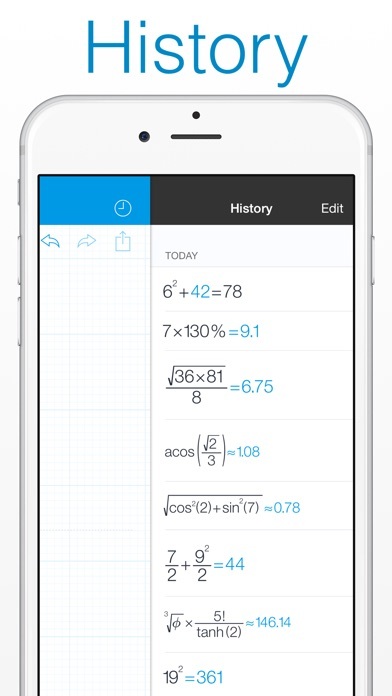 The app includes nearly every mathematical operation and function that could be desired for most high school math and science classes. Developers have done an excellent job of making the app easy to use and accurate. Users should be aware, however, that the app isn’t quite as versatile as old-fashioned scratch paper. For example, it gets confused if the user writes problems in vertical instead of horizontal format, as a younger student may be inclined to do. It also can misread numbers or symbols that include extraneous lines, such as two zeros connected at the top as some do when writing a cursive “100” or a percent sign written as a loop attached to a number seven, instead of both circles being completely separate from the slash mark. A little experimentation will help users uncover these quirks, and neat handwriting will prevent most of them. 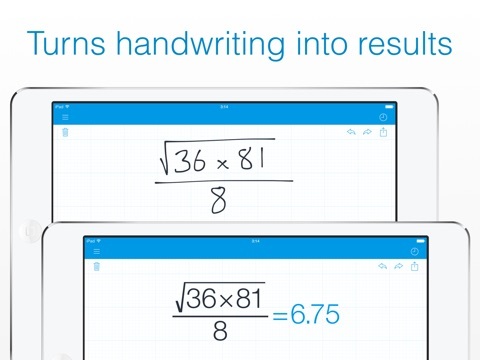 MyScript Calculator is an excellent handwriting input calculator. It has numerous options and features that will help students get the most out of the app. A built-in tutorial with video clips of screen shots is well-designed and answers nearly all questions. The Settings section allows users to control the default number of decimal places in answers, the way the app handles long, repeating or non-terminating decimals (truncating or rounding), the method of reporting angle measures, and even whether the device calculates automatically or on demand. 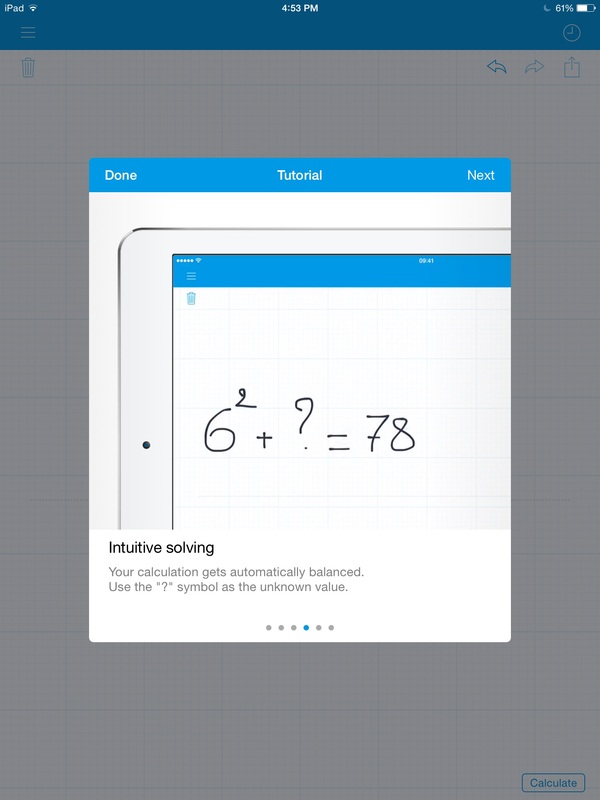 This feature helps users have more time to write the problem out before the calculator solves it or even to have the opportunity to work on the problem mentally before seeing the answer. 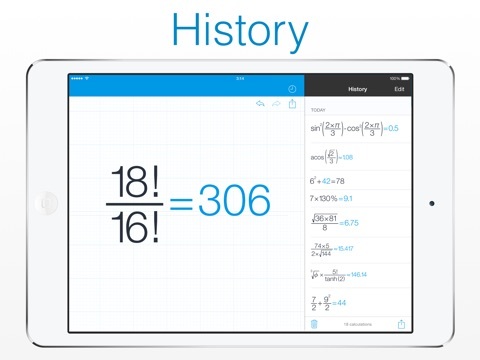 It’s easy to fix mistakes on MyScript Calculator, as well. 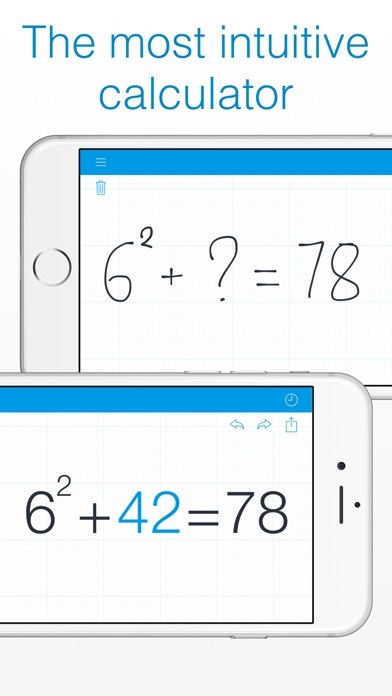 The app allows users to cross out, scratch out, or even overwrite incorrect numerals or operation signs. 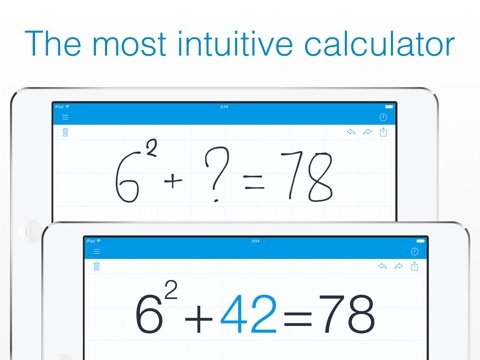 This is actually much easier to manage than on traditional calculators, even on a tablet. There’s no keyboard, and no need to erase most of the equation to fix a mistake entered early in the process. If users want to keep track of solved equations, these can be copied to the clipboard, emailed, or shared via Dropbox or similar programs. This makes it easy to save them for later or to allow someone else to check the work. 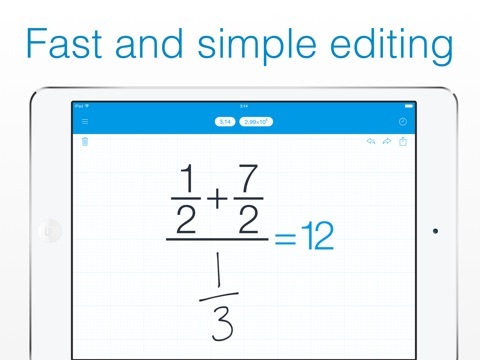 MyScript Calculator is a free app that will be incredibly useful, so it’s an outstanding value. 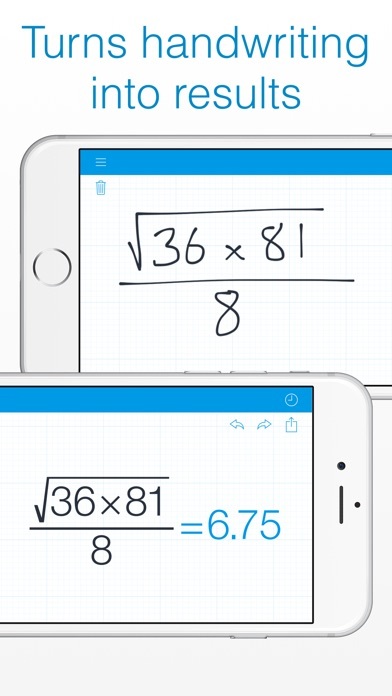 Scientific calculators can be a bit pricy, and this app seems to have the same functionality with the added bonus of accepting hand-written input. 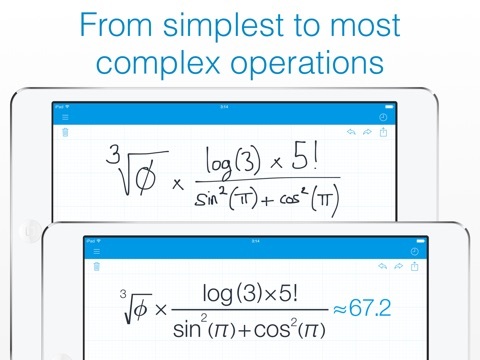 The app does offer an in-app purchase for ninety-nine cents that extends the functionality of the system, allowing users to save equations in a history section, to save answers to use in future calculations, and to immediately reuse the answer to a calculation in the next one. These features are all available on a trial basis when you first get the app and will deactivate after a specific number of uses. MyScript Calculator should not be used by children under age 13. It contains unprotected links to other apps from the developer, the in-app purchase of the “PowerPack,” and links to email, social media, and the developers’ website.